Blending guerrilla outdoor messaging, advanced web technology, psychological methodology and high-quality video, the Byzantium Tests campaign introduced a new audience to the original Cinemax series, Hunted. 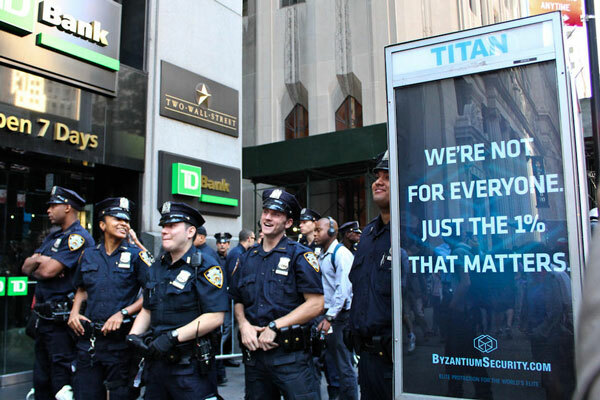 To launch our campaign, we placed provocative outdoor billboards in and around Wall Street, to coincide with the first anniversary of the Occupy Wall Street protest. News photographs and video coverage blurred the line between fiction and reality, propelling the campaign onto the front page of websites and newspapers. This image, taken by photojournalist Armando Gallardo, was one of the most widely circulated of the day. Visiting the URL that appeared on both outdoor posters and in a hyper-targeted banner campaign, visitors discovered the Byzantium Security International website, the centerpiece of which was this short “corporate video” (which was also featured on-air on Cinemax). As this happened, journalists, fan communities and pop culture personalities received custom-crafted wooden puzzles in the shape of the Byzantium Security logo. Those who successfully unlocked the puzzle found a USB stick containing a dossier of press information, including a special video message from Byzantium Security. At the heart of the campaign: a series of five dark psychological tests that introduced participants to the murky world of corporate espionage. With specially-shot footage of Hunted’s main character (played by Emmy Award Nominee Melissa George), these tests culminated in a mind-bending finale that provoked intense social sharing and discussion. You can read a selection of comments posted by fans across all social media channels in this Storify. During the 12-week campaign, more than 1.3 million fans took the Byzantium Tests, each spending an average of 13 minutes on the site, dramatically exceeding all anticipated metrics for success. 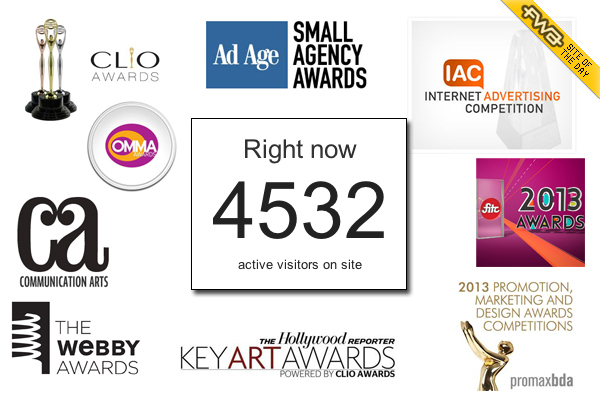 The work has subsequently been honored by competition juries, receiving 15 individual awards, including the Ad Age Small Agency Campaign of the Year. Virtually all participants in Byzantium Tests arrived through earned media, and word of mouth. The program generated hundreds of millions of media impression through social sharing and press, including: LA Daily News, The Huffington Post, Wired Magazine,, Animal NYC, Adweek and Creativity. Elements of the campaign were also featured on the front page of Reddit - not once but THREE times, generating thousands of comments (here, here and here). The campaign was also the subject of academic discourse at Cultural Learnings and Antenna.